Reiki is an energy healing technique. A session is guided by the universal life force to harness the flow of energy throughout the body. 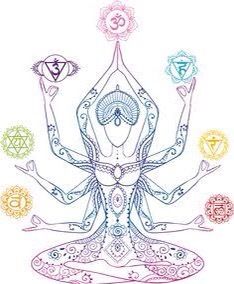 Chakras are energy chambers located all over the body. Think of them as wheels of energy spinning, they need to be charged up from the outside to flow smoothly. Chakras can get knotted up, therefore not allowing energy to pass through areas on the body properly. This makes it difficult for us to go inside ourselves and release emotion that needs to be cleared. The chakras need to be cleared of knots, and strengthened, to flow to their peak performance. Reiki can bring deep relaxation, a boost of energy, or speed up healing in the body as the chakras are receiving. The flow of reiki in the chakras is essential in completing your inner self and staying balanced. To transfer reiki, I hover my hands over the chakras down the center of the body. Energy flows through my hands to the client. I primarily work with my hands off the body, unless there is a need for more energy in a specific area, or if the client has a preference. I find it easier to relax while receiving when the hands hover, rather than touch. The great thing is, there is nothing that can go “wrong” in an session. The reiki always works. Reiki energy flows when, and where it is needed. You can be sleeping the entire session and the energy will still flow! You may feel the reiki passing through your body, a boost of energy, deep thoughts and insights, or you may just feel extreme relaxation. Reiki restores energy and balance to the body. Depending on what you need, it could release emotional responses during or after a session. Reiki can heal injuries as well. I work specifically on spiritual and emotional wellness. Balance of the mind, body, and soul. While abroad, I am offering donation based healings. This is a way for people to try it out and see what they think! It seems silly to charge a normal rate when the cost of living is so cheap out here. Also, most of my clients are travelers and will only be experiencing a session or two, this is the best way for me to offer something new! A normal 1 hours session in Sacramento, California would be $75, similar to the cost of a wellness massage. I am currently booking 1 hour or 1/2 hour sessions. Stay tuned for a post on my personal reiki journey and testimonials!